In, may as well wander along. Is O'Doherty going to play after concussion? What will the midfield look like? Up against Isais - uh oh! Wouldn't be surprised to see Tokich Roly and Mahazi midfield. Or Tokich Roly with Fitz in front again. Kamau, Yeboah, Majok wingers. Babbel is going to have to put Roly in the midfield somewhere simply due to no other options. Has to put Roly in the middle if O'Doherty cannot play. And if Tokich is fit play in the starting 11 over Mahazi and see what the boys can do. Adelaide plays similar to Perth except they don't have a striker but they have Craig Goodwin, we can get a result but again we are likely concede middle of the park we are really scraping the barrel. We also play Heartle$$ (away) on Tuesday with the seagulls reinforcing their squad. Monte was in last year's winning NYL squad along with Suman, Russell, Mourdoukoutas, Cordier, Grozos, Majok. He is DM/CM but I hope he has bulked up on last year. Has a goal in him. 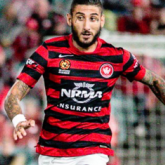 Agamemnonos is in our NYL squad and appears to more of an AM but has played CM. The NYL squad has a winning mentality. Thanks. Great to see all these young guys rising up. Do agree with your comment about physique though. While not knowing these two, I had noticed how scrawny the NYL kids look - with the exception of Russell who seems quite solid. Blimey - by the time this season is over: NYL = HAL team. Nizic and Scott missing, as expected. Tokich as well, but not listed as injured. That should clarify his future at the club. So it seems it'll be the NYL midfield haha. unless Ziggler gets pushed into the DM with Hamill and Tas behind? Might be worth a shot, but Ziggy's knees aren't 100% and might not be able to handle the load. Instead of using Roly we might as well see which of our youth midfielders could perform as an attacking midfielder. Monge runs the NYL, I rate him above any other youth player we have. Happy to see the kids on the field, just hope they can handle the reds midfield or we'll get destroyed and they get demoralised by a heavy loss. Am I ******* mental thinking we could win this one ? Anything is possible with our team. If we keep a clean sheet......perhaps. We were the better side against the league leaders and just lost, Our defence, or lack of, is what is costing us.Stop Isais and you are well on the way to stopping Adelaide.Realistically you would have to pick the Reds due to our injuries and suspension. 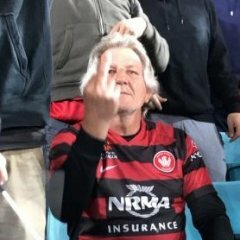 Head says Reds heart says Wanderers. We are not out of the finals mathematically but have to start winning games. Hopefully all the pea hearts who haven't been attending can find it within themselves to come support the boys. They've been putting in the effort lately and no matter the results its about time people show their support. 17000 members and last few games have looked like 4000. Yeah I am thinking mobility will be the key is we are to be successful in this one. We are all mental.. But from 'mental;' comes 'mentality'. Will this be the hottest weather temperature game the Wanderers have played in tonight I wonder? We beat Wellington at Penriff in 37 degree heat the other year. We're a Team of youngsters, we should be able to run em round have them ragged and suffering from heat exhaustion and dehydration by half time.